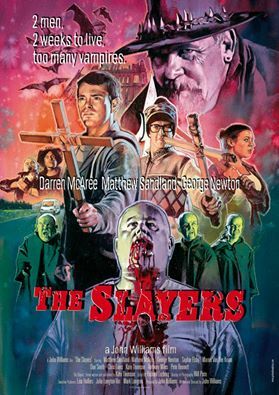 John Williams (director of 'THE MOTHERTOWN') has gone and revealed the poster for his upcoming comedy/horror vampire film 'THE SLAYERS' and if the artistry looks familiar that is because he has got the one and only artist known as Graham Humphreys to do the art. The film will be making its premiere next month and you can be damn sure that we will review this latest effort from the Stoke-On-Trent native. The Slayers follows 2 cult members as they break ranks and decide to go on a adventure road trip to make the most of, what they believe to be, the last two weeks on earth. The two hapless men plan a bucket list and head off in an old motor home to the mountains of Scotland to camp, skydive, meet girls and drink. It isn't long before Nigel and Job start to encounter strange characters who claim to be vampire slayers. Believing it to be a test from god, they follow the slayers in a game of cat and mouse with vampires and the boys own stupidity. You can be sure that upon release we will bring you a review. Keep up to date with 'THE SLAYERS' via Facebook here and be sure to give them a 'LIKE'. You can also go to: http://www.theslayersmovie.com/ for more information.